Iacopo joined the Use Less Group as a PhD student in October 2016. He works as part of the Novel Materials Processing Technologies team and his research focuses on the development of a tactile interface for the design of tool-paths in metal spinning and other metal forming techniques. He hopes to capture the skill and intuition of craftsmen in order to design failure-free tool-paths in flexible asymmetric metal spinning. 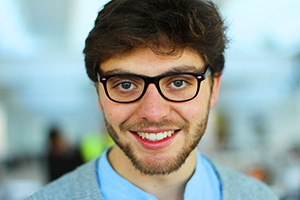 Iacopo holds an MEng in Materials Science & Engineering from Imperial College London. During his undergraduate studies, he also attended MIT as an exchange student - an experience which broadened his engineering skills set and sharpened his passion for industrial sustainability and sustainable materials. His research is funded by an EPSRC DTP studentship.